Recently, whilst browsing my Facebook newsfeed, I kept noticing certain little Ads pop up. They were very specific however, as they tended to link back to fan pages of something very specific, (such as a movie) and the Ad was promoting some sort of related merchandise, (such as a tshirt) to buy. 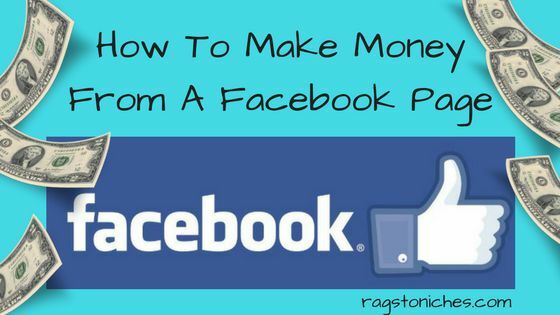 This got me thinking about about how to make money from a Facebook page – there are a host of ways you could make money, via social media alone. Now, this is not currently experience talking! My activity on Facebook is limited at best, (yes, another thing to put on the list). But this sparked my curiosity and if you’re reading this, I’m guessing you’re also interested about ways you can make money from a Facebook page? Well, it’s certainly very possible, so read on. …this is what I was initially exposed to. 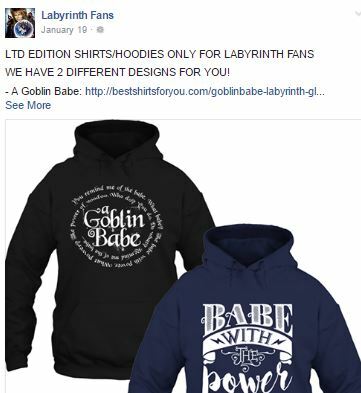 You see, I am a Labyrinth fan, (yes, that 80’s classic with David Bowie in the tights…) and I noticed that this fan page is selling Labyrinth related items. Then, I recently saw “The Nightmare Before Christmas” items popping up on my newsfeed, (yep, a Tim Burton fan too). I’d seen this sort of stuff for a long time, but I guess I must have been too distracted at the time to see the income opportunity there. However, for anyone that is interested, it’s certainly something to consider that by picking a particular niche and gaining thousands of fans on Facebook – you can then sell related merchandise to them. Whether that be via affiliate marketing, drop shipping, or your own online store. You’ll basically have the ready-made perfect sales base right there waiting and Facebook Ads would be a good option for drawing in highly relevant customers. The only reason I saw this stuff at all myself, is that I had certain “likes” on my Facebook profile – as well as all kinds of other information and Facebook knows all about my likes and dislikes. Useful Post: Guide To Making Your First Affiliate Sale Online! First Off – Find Your Niche! So, initially, you’ll want to come up with a niche that’s popular, but not totally over saturated. In the first two cases that I mentioned, those are both movies with cult status – but not so ridiculously popular that there will be over riding competition selling related items. The great thing about choosing a narrow niche for this, is that you can really market Facebook Ads directly to your very specific audience. I see Ads for Labyrinth merchandise, simply because I have Labyrinth listed under my movie likes – and I’m also a member of a fan page or two. Facebook has direct access to this information, making me a prospective customer. Now, it’s worth mentioning that you will always want to attempt this sort of thing from a Facebook Page – this is not something you’d set up from a personal profile. In order to make any money at all, you’re obviously going to need a lot of people to like your page. You could use Facebook Ads to boost your page and get new likes, although I have read evidence that this can often result in a whole bunch of inactive users. You can search people out, who are relevant to your niche though and invite them directly to your page. If you do this actively each day, you can build up followers over time. You could also draw people from Pinterest. Create relevant Pins to your niches, linking them to your FB page. Use Affiliate Marketing To Generate Sales. One key way you could earn money from your new Facebook fan page, is via affiliate marketing. For a full explanation of Affiliate marketing – see this post. 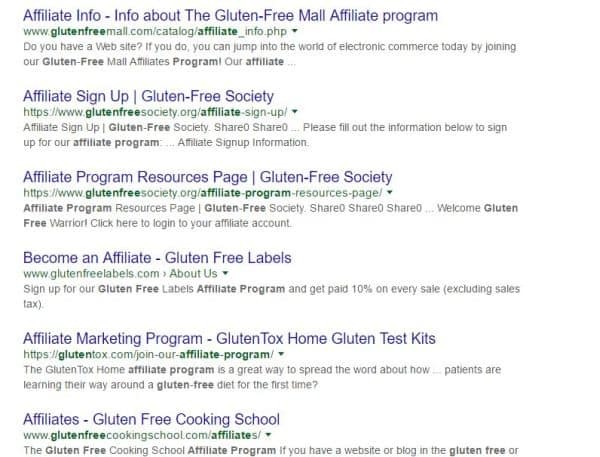 Many companies do require you to have a website in order to start affiliate marketing with them, but some do not! Either way, having a website anyway is a very good idea. You can use Facebook to drive traffic to your site too. Related Post – How To Create A Free Website Online Today! The biggest affiliate program on the web is the Amazon Associates program and it’s also one of the easiest to get accepted on to. Now, until recently people thought that you cannot sign up with Amazon associates unless you have a website. But actually, people have reported that by simply adding their twitter of Pinterest profile link to the “website section” in the application – this was enough to get them accepted. As long as they had a decent amount of followers presumably, so make sure you have built up a social media following first. Update: Amazon now have an “Influencer Program,” where you can earn affiliate commissions via a qualifying YouTube, Facebook, Twitter, or Instagram account. See details here. Amazon is a great way to make money fairly easily as an affiliate – it’s where I got my first sale. However, with other programs, it’s best to double check whether they require you to have a website. An example of a site that does not require you to have any website is Clickbank. Clickbank sells digital products, but there is a lot of junk on there so you need to do your research to find decent products. Useful Post: Clickbank, Is It Just A Scam? Since it’s simple to create a website for free, it’s worth building one anyway, because your own website will be useful to you down the road – whatever direction you go in. Selling Merchandise Via Your Facebook Page! A common way that I’ve noticed these sites make money, is by selling merchandise related to their niche – often clothing items, but commonly other things like mugs or phone cases as well. Companies such as Teespring actually give you 50% commission per Tshirt you sell, which is pretty good going. You design the shirt, you tell them what you want on it, they make it. However, you need to be careful with copyright issues! Don’t just go throwing anything you like on a t-shirt and hope for the best, you need to ensure whatever you choose to put out there is not trademarked. Alternatively, for some images you will be able to purchase a license, but that can be pricey. Gearbubble – which is a crowdfunding platform and you can create a variety of products, such as phone cases, mugs, necklaces and bracelets. Teechip – another crowdfunding platform that sell a range of products like Gearbubble do. Teezily – which is similar to teespring and also, aimed strongly to European users. And now, Amazon also has an exciting new program in development, called Merch By Amazon. Merch By Amazon allows you to upload your designs and they create the Tshirts and deal with every other aspect, including customer service, packaging, shipping and so forth. At the moment you need to apply and it’s by invite only. Update: You can still apply, but I believe there are stricter conditions in place as far as getting an account. You can apply via their website and wait to be invited, which could take several months at least to get accepted. But the great thing about it is, there are no start up costs and you will only reap the profits when your designs sell. Naturally, Tshirts can fit into a whole host of niches. If you’re worried that you’re not much of a designer… you could certainly affordably outsource the design work on Upwork. Making Money With Ebooks On Facebook! Even if your niche is based on a popular brand like Harry Potter or Star Wars, there are still ebooks you could create. Such as the “unofficial Hilarious Guide To Harry Potter..” For example! If you’re not much of a writer, you can also outsource your ebook writer too. If you already have a booming Facebook page related to your niche, you have an awesome audience right there and they’re your ideal customers. Research potential affiliate programs, or have a plan of what merchandise you might sell. Set up your Facebook page, (ideally a website too). Make your facebook look appealing, you can create great Facebook headers on Canva.com for free. Spend significant time building up your page and brand by posting shareable content on a daily basis. Invite people daily to your new page, search people out on Facebook relevant to your niche by seeking our relevant fan pages on Facebook and seeing who likes them! Once you have an active page, sign up to relevant affiliate programs in your niche that will work well – alternatively, figure out what merchandise you’re going to create, or what ebook you’ll put out there, (maybe you’re going to do a combination of things, do one at a time!). Once you have your product, you can also target a specific audience with Facebook Ads, to generate more sales and likes to your page. Promote your products now and then, in between offering good content that you’re audience will enjoy or appreciate. To get more money, you can also sell space on your Facebook page. You will need 1000 likes before you can do this. Sign up to shopsomething.com – you can set a price per post on your page. Check out what others are doing in order to set a realistic price. I’m certainly going to be looking into applying to Merch By Amazon – I’ve been an Amazon affiliate for long while and one thing they can do very well, is sell! I hope you found some of these ideas useful, do you have any other ways you’ve thought of making money from your Facebook page? I’m intrigued. Never thought about using FB as a platform solely for making money. I’ve always viewed social media as is, a platform for socializing. It wasn’t until WA that I saw it can be used to promote our site and products. But this takes it a step further and actually monetize the social media account. Very cool indeed! Hi Wing, yes it is pretty cool. I haven’t thought about it much myself but it’s something I’d be quite interested in doing… another side line perhaps. I’d be interested in hearing whether anyone else has had success with it. Cheers for the comment!